- We would like to invite you to our first EM Open House and Jeti Introduction Workshop. 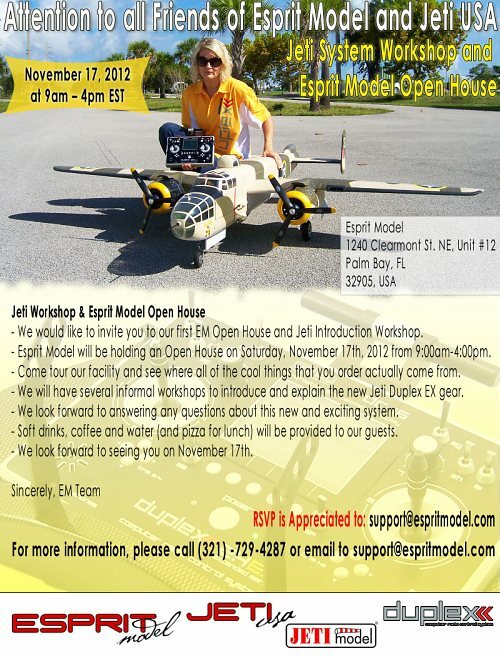 - Esprit Model will be holding an Open House on Saturday, November 17th, 2012 from 9:00am-4:00pm. - Come tour our facility and see where all of the cool things that you order actually come from. - We will have several informal workshops to introduce and explain the new Jeti Duplex EX gear. - We look forward to answering any questions about this new and exciting system. - Soft drinks, coffee and water (and pizza for lunch) will be provided to our guests. - We look forward to seeing you on November 17th.